The two-step is a popular form of country western dancing. Though the move originated from the Fox Trot, over the years it has evolved into a fun, energetic dance often accompanied by cowboy boots. Today, there are a few different two-step variations, and you can learn each of them at the Arthur Murray Dance Center in Gaithersburg, MD. Call us today at 301-590-0387 to learn about our class offerings. The two-step can be anything from basic back and forth with a partner, to more complicated patterns with spins, slides and other styling. However, it’s usually characterized by two quick steps and two slow steps. 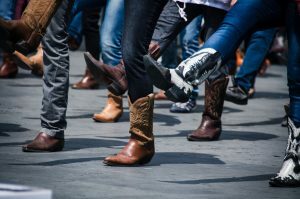 At Arthur Murray, we teach two types – the Progressive Two-Step and the Texas Two-Step – as part of our country western syllabus, along with a specialty variation called the Nightclub Two-Step. Progressive Two-Step – Dating back to the 1800s, this two-step was first danced between men. Now, it’s often danced between a man and a woman with a series of rapid spins and turns to help them move down the dance floor, instead of just remaining in one spot. Texas Two-Step – This dance is slightly different than the Progressive version due to its slower tempo. During the two slow counts, dancers will usually add in an exaggerated, side-to-side brushing action. Nightclub Two-Step – Prefer pop songs over country music? This version is for you. It’s similar to the Salsa, but slower and smoother, making it great for romantic ballads at weddings. When anyone first learns to dance the two-step, it’s important to get the basic footwork down first. After that, you can work on your posture and frame, following and leading techniques and even adding more advanced maneuvers along the way. Eventually, some two-step dancers will become competitive and enter competitions, while others simply do it for fun. Become a two-step dancer in no time by taking lessons at Arthur Murray Dance Studio in Gaithersburg, MD. Just fill out our online form and we’ll get you started.